I’ve been crunching data again, and following on from my previous infographics, this time it’s the turn of my own surname – Martin. 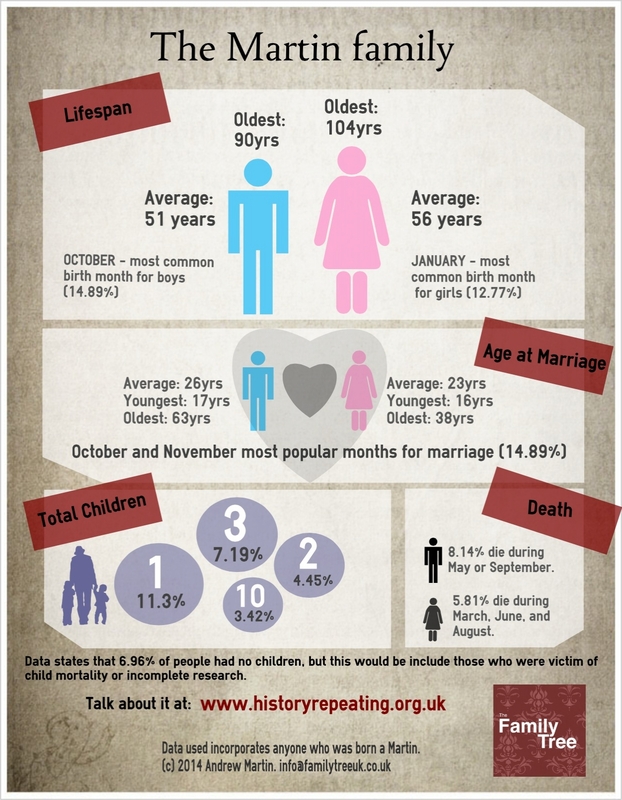 How do the life statistics stack up? Maybe the last three are connected? Is data showing that the agricultural occupations of the male Martin name-bearers was central to their home lives? As for the age of death for men, fitting in with agricultural calendars – there may be some truth in this, similar to the parallel decline in UK heavy industry and the increase in male life expectancy in the 1980s. As for me, well, it looks like that statistically i’ve got about 16 years left, will have one child, still have time to marry, and will probably die at one of my birthday parties (May). I look forward to skewing the figures (the good way! ).